The filling of vapor space in a liquid containing tank with a gas is referred to as "tank blanketing", and sometimes "padding". 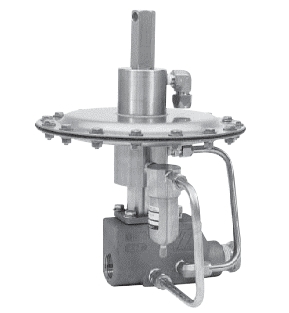 Specialized valves are available, designed to simplify the incorporation of a tank blanketing function in an operation. Often, the gas employed to fill the vapor space in a tank is nitrogen. The purpose of blanketing can vary, but generally involves preservation of the stored product or safety. In both cases, one goal is to keep oxygen levels in the vapor space sufficiently low to inhibit ignition of flammable products, or minimize oxidation and its impact on stored product quality. The inflow of blanketing gas can also be used to keep the tank under positive pressure relative to the surrounding space, considered to harbor contaminants which could otherwise leak into the tank. What are some functions of a tank blanketing valve? Maintain positive pressure in the tank at a selected setpoint. Provide gas control at very low flow rates, or close bubble tight, when tank liquid level is static. Adjust gas flow to compensate for the maximum liquid draw down rate. Provide sufficient closure to prevent supply gas from excessively pressurizing tank. Bubble tight shutoff to prevent wasting of purge gas. Self cleaning flow path design. Pressure balanced pilot, so supply pressure fluctuations do not impact the setpoint. Setpoint not appreciably affected by changes in temperature. Low maintenance requirements, including complete access to valve internals without removing the valve from the tank. More detail, including a description of the elements required for proper valve sizing, is found in the document below. Share your fluid process measurement and control challenges with application specialists, combining your process experience and knowledge with their product application expertise to develop effective solutions. Process Tank Blanketing Valve from Miller Energy, Inc.
Compressed air, a common source of power in many industrial settings, functions best when treated in a number of ways to remove contaminants that can damage or impair downstream devices and equipment. One contaminant of concern is moisture. There are a number of methods and technologies available to reduce the absolute moisture content of compressed air. Each has its own set of positive, as well as limiting, aspects that dictate the best way to apply the technology. 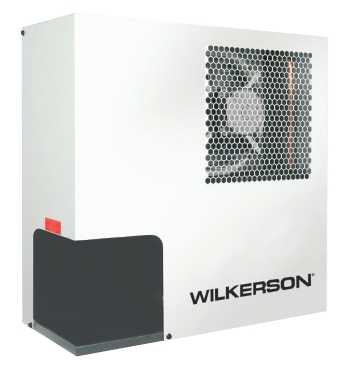 Refrigerated air dryers employ essentially the same principle used to dehumidify air in occupied spaces within commercial buildings and residences. The incoming compressed air is cooled through the use of a mechanical refrigeration system. Cooling the compressed air results in condensing a portion of it's moisture content. The chilled air is then used to pre-cool the incoming compressed air, boosting the cooling system effectiveness and increasing the temperature of the discharge air. This increase in the discharge air temperature is also helpful in preventing condensate formation on the downstream system piping. The refrigerated air dryer is a single part of what should be a total approach to compressed air quality. Here is a schematic example. More information and detail is provided in the document below. Share your compressed air system requirements and challenges with application experts, combining your process experience and knowledge with their product application expertise to develop effective solutions. Compressed Air Dryer Products for Industrial Applications from Miller Energy, Inc.
At the basic level, a solenoid is an electromagnetic coil and a metallic rod or arm. Electrical current flow though the coil produces a magnetic field, the force of which will move the rod. The movable component of the solenoid is linked to, or part of, the operating mechanism of another device. This allows the switched electrical output of a controller to regulate mechanical movement in another device and cause a change in its operation. A common solenoid application is the operation of valves. The document provided below illustrates a portion of the broad array of solenoid valves available for industrial control applications. There are also some good cutaway illustrations showing the internal operating valve parts. Share your valve requirements and challenges with an application specialist. Combining your process application knowledge with their product expertise will produce effective solutions. 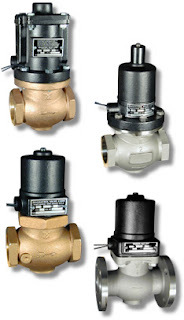 Industrial Solenoid Valves, Bronze and Stainless Steel from Miller Energy, Inc.
Gas pressure control is critical in many applications like life sciences and chemical/petrochemical research where flow is an integral part of the process. Brooks Instrument electronic pressure controllers can be used as they require flow to function. Compared to using a mechanical pressure regulator, electronic pressure controllers eliminate droop, boost and hysteresis, offering stable pressure control. There are two configurations available for pressure control – upstream and downstream. This terminology is somewhat unique to Brooks Instrument electronic pressure controllers. Downstream pressure controllers maintain the pressure downstream of the device itself, increasing flow to increase the pressure and decreasing flow to decrease the pressure. For this reason, this is called direct acting. This configuration is commonly called a standard pressure regulator. A downstream pressure controller acts very similar to a typical mass flow controller because they are both direct acting. 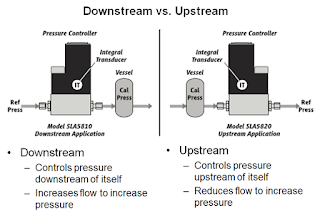 Upstream pressure controllers maintain the pressure upstream of the device itself, increasing flow to reduce the pressure and decreasing flow to increase the pressure. For this reason, this is called reverse acting. This configuration is commonly called a back pressure regulator in the industry. Maximum flow rate being used to maintain pressure -The “sweet spot” for pressure control is between 100 SCCM and 5 SLPM. As long as flow is present in a process you will typically find the need for some type of pressure control. Vessel sizes up to 30 liters commonly use flow rates up to 3 SLPM during their process steps. 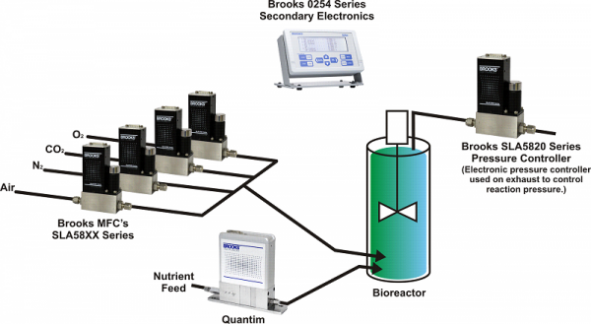 Brooks Instrument pressure controllers are a perfect fit for these services, offering stable pressure control with no droop, boost or hysteresis, which are commonly experienced when using a mechanical pressure regulator.